Advocate Vas Soni has resigned from the SIU. The Presidency has received a resignation letter from the head of the Special Investigating Unit (SIU). This was announced in a statement that was released by the presidency on Monday. According to the statement, President Jacob Zuma, who had originally appointed Advocate Vas Soni to head the Unit back in September, 2013 had accepted the head investigator’s resignation. 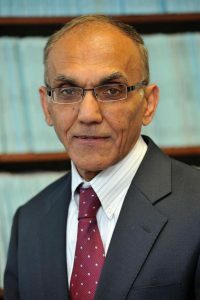 In his response letter to Soni’s resignation, Zuma said, “It is with regret that I accept Advocate Soni’s resignation given the good work he has done at the SIU in a short space of time, but I understand the painful personal circumstances.” The Presidency also said in the statement that they were aware that the advocate’s wife had been ill for some time and Mr Soni had indicated that he wanted to take time off his busy schedule to be with her during her difficult time. He said, “We wish him and his wife well during this difficult period,” adding that he wished Mrs Soni a speedy return to good health. Advocate Soni was earlier on Monday in an interview with eNCA and confirmed that he was stepping down from his position as the head of the Special Investigations Unit because he wanted to spend time with his ill wife. When asked if the responsibility of his position had been stressful, he answered in the affirmative, adding that, having not worked in the public sector for most of his life, he had not been aware of the amount of pressure and challenge his new appointment had entailed. Mr Soni was the man at the centre of the report that was made by the SIU after the Nkandla debacle in which President Zuma was accused of using tax payers’ money in the upgrade to his home back in 2014. His report, which was released in 2013 and was presented parallel to the one by head of the Public Protector’s Office, Thuli Madonsela, while admitting that there had been extravagance in the building of Nkandla, had refrained from laying the blame for it on Zuma as Madonsela had done. Instead, the SIU’s report had said that blame of the extravagance should be laid at the feet of Minenhle Makhanya, who had been Zuma’s architect of choice. It further recommended that if there was repayment to be made, this be done by Makhanya. In this regard, the SIU had instituted a civil suit case against Makhanya. This civil case suit, which was originally meant to have been heard in the Pietermaritzburg High Court last year, was postponed to February 25.